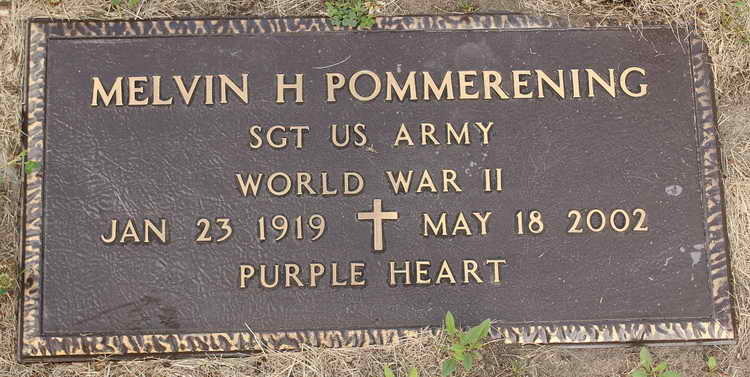 Grave marker for Melvin H. Pommerening in St Mary Cemetery, Long Prairie (Todd county), Minnesota. Melvin enlisted in the Army 6 June 1941and was assigned to Company H, 508th PIR. T.4 Pommerening was wounded in action in September 1944 and rejoined the company on 23 October from the Hq 61st Gen Hospital. Hios military decorations include the Purple Heart and the Bronze Service Arrowhead device awarded for participation in Normandy assault.